This is how I spent my time during the most recent (nasty!) snow storm. Thirteen inches of snow then sleet and rain and then more snow. 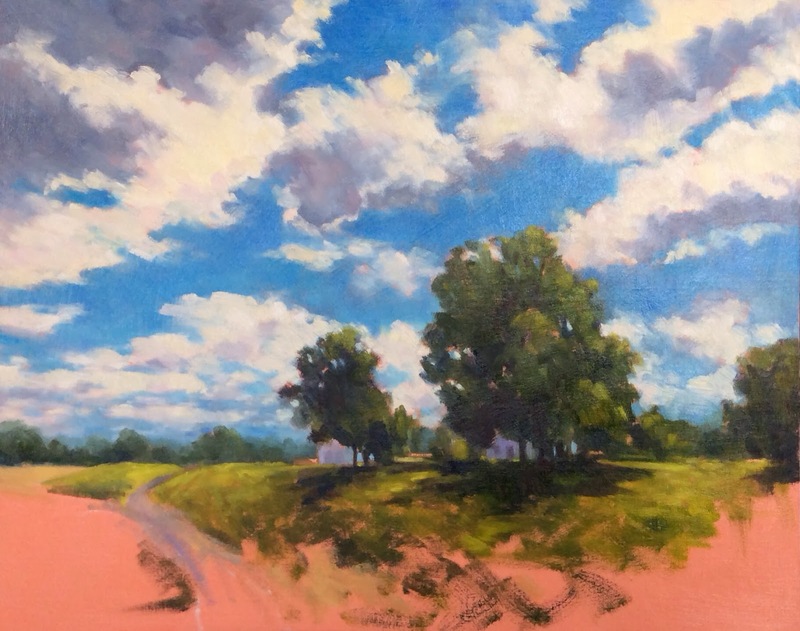 I was just not up to a gray, cold painting so I turned my back on the window, set one of my favorite summer paintings from the Farmhouse series next to my easel and painted. I felt warmer and happier just immersing myself in it. I finished it late this afternoon but it is dark out now so I will wait until daylight to photograph it and share it here. As you can tell by the date on the last post I have been off blog again. It has been an extremely busy couple of weeks and what little time I have I choose to spend in the studio. 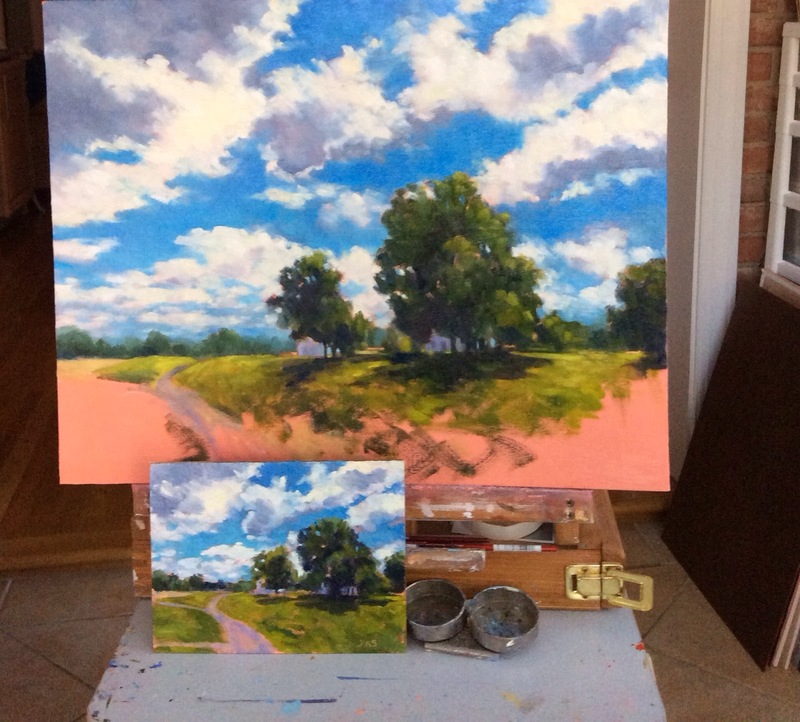 I have persisted with this painting and made the decisions I talked about regarding the foreground. 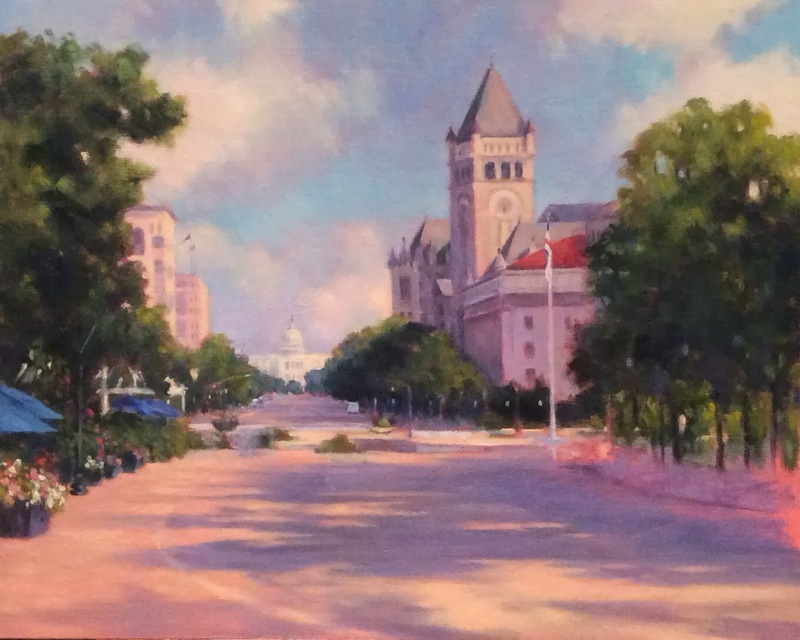 I decided against the foreground figure as I found it too strong a focal point and prevented the eye from moving back to the Capitol building. I will be including vehicles in the background, a row of parked cars along the right hand curve and I will add some brush strokes to indicate pedestrians. The painting is not overly tight right now and it will be a challenge to keep it that way. I find that to be difficult when working in a state of interruption as I have. I have been busy with Art League Board meetings and hanging paintings for our main fundraiser of the year, The Patron's Show. I will upload some photos of the hanging in progress but you can also go to the Art League blog to see some. We will have 650 works of art on view and the day of the event all 650 patrons will go home with a work of art valued at a minimum of $200 which is the price of a ticket. Most of the work is worth much, much more. To see the work available go www.theartleague.org and click on our Flickr link. Lots more going on so check back in a day or so. I am also getting around to a website update, Finally! SOLD at the Salmagundi Club "24 Hour Cafe"
I made a fair amount of progress on this yet to be titled Pennsylvania Avenue painting today. I worked well beyond the point at which this photo was taken but I wanted to stop and photograph it while the light in the studio was still bright. Today was a beautiful day with a touch of spring in the air. Snow and ice melted away and I was inspired to work with bright color. I have a number of decisions to make. Do I want a row of cars on the right as I have sketched in? Do I want to keep the foreground figure and what other figures do I want to put in? How do I want to go about suggesting detail without actually adding detail? They are important decisions but the most important ones have been made and I am optimistic about the outcome of this painting. I am at the fun stage! In June and July I will be involved in several exhibits and it is time to start preparing for those. I will be working on cityscapes, nocturnes and paintings with a summer theme. I have learned how quickly four months can go by and I want to have a lot of new work to select from. I feel energized! 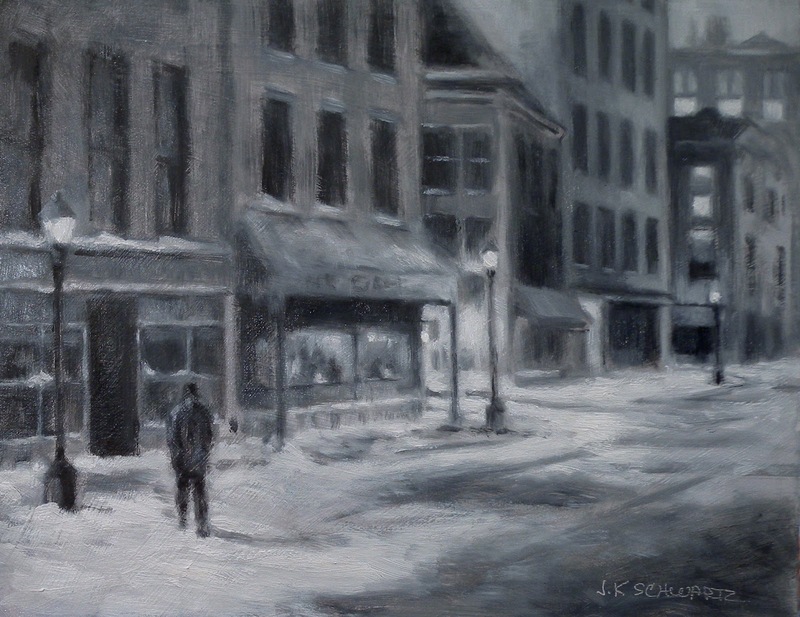 "The Black and White Show" at the Salmagundi Club, 47 5th Ave., NYC until February 14th. You can now view the entire show online at www.salmagundi.org. and this year's show is a really good one! 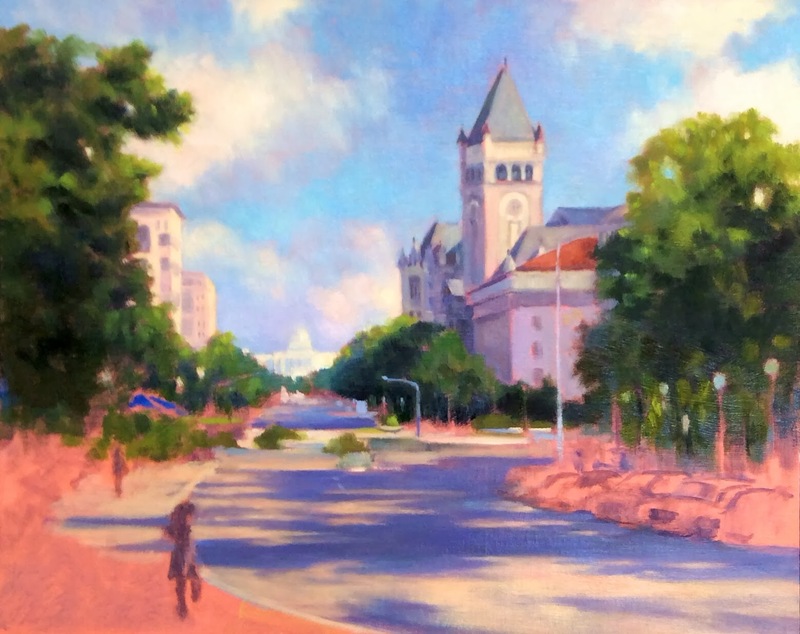 American Paintings Fine Art; 5118 MacArthur Boulevard, Washington DC ; I have six paintings with a Potomac or C&O Canal theme on view through March. "The Annual Members Show" also at the Salmagundi Club will open any day now. All the paintings are there and ready to be hung as soon as work on the Main Gallery is complete.